The reason to check your tire pressure is usually explained with some nearly unbelievable statistical simile bordering on hyperbole. If everyone checked their tire pressure once a month, we could save enough oil to build comfortable cities on the moon and help kittens. Or something like that. The fact is checking tire pressure on a regular basis can improve handling, increase fuel economy, promote tire longevity, and even save lives. Check early and often is a phrase we toss about frequently here at Jalopnik, and is certainly one that applies to checking tire pressure. Tires can lose a few pounds of pressure a month just sitting. Hitting chuckholes or traveling on rough roads can accelerate pressure loss. Deep freeze weather can also cause tires to lose a few pounds. Unless your name is Bibendum, you can't determine tire pressure just by looking. Checking tire pressure requires a gauge. Incorrect tire pressure is the number one cause of tire failure. Low pressure brings too much of the tire surface in contact with the road. This contact with the tarmac builds excessive heat. The heat buildup can cause a tire to come apart. Adding a load to the vehicle and going on a long trip at high speeds intensifies this effect. Too much pressure can cause quick tire wear as too little of the tire is making contact. Tires inflated to teakwood pressure can also produce a harsh ride. Since the recommended tire pressures are measured cold by the vehicle manufacturer, this is also when operating tire pressure must be checked. As the tires get warm from driving around, so does the air inside. In the morning before the vehicle goes anywhere is a good time to check pressure and add a few pounds. Failing that check tire pressure within a mile of home, or wait until the tires have cooled. Have lunch. Check later. Run tires with the pressure recommended by the vehicle manufacturer. These numbers may vary front to rear, or according to vehicle load. The pressure number on the side of the tire is maximum tire pressure, not the operating pressure! Cities on the moon and kittens aside, checking the tire pressure at least once a month can be of vastly greater benefit than harm, and is something that's wicked easy to do. Check pressure when the tires are cold. If you have to drive to a gas station for air, choose one within a mile from the driveway or parking spot. Start by removing the cap on the tire valve. Tire gauges come in all manner of types and sizes. The key is to use the same gauge all the time for consistency. The gauge at the gas station will always be broken. 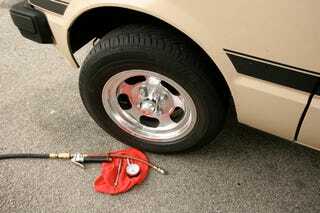 Push the tire pressure gauge down onto the valve and hold until it gives a pressure reading. Add air if pressure is below vehicle manufacturers recommendations, and depending on load. These recommended pressures can be found on the driver side door, or on a sticker inside the glove box. Too much pressure! The nub on the backside of the tire pressure gauge is designed to push in the valve and let air out of the tire for pressure adjustment. Recheck pressure with gauge. Add air. Let some out. Recheck pressure. And so on. Replace the cap and check the other three tires. Checking the spare tire pressure is also a good idea. A flat spare tire can cause excessive roadside swearing. Spares usually have their own recommended pressure on the tire itself. Return to "How To Winterize Your Car In Ten Easy Steps."